Tips belong to the workers who earn them. But a new rule under this administration is threatening the wages Ohio workers earn. In December, the U.S. Department of Labor proposed new regulations that would allow employers to force workers to hand over hard-earned tips to managers, and there is nothing in the rule that prevents employers from keeping the money for themselves. As a result, an independent analysis found American families would lose $5.8 billion in tips that they’ve earned and depend on. This includes Ohioans like Cristal Hale, from Hubbard, who I talked with last week. Cristal relies on tips from her job at Denny’s to help support her family. This month, it was reported that the Department of Labor did its own analysis of how this change would impact workers, and their internal review also found the change would cause workers to lose out on billions of dollars. But what did the agency do with this damning evidence? I sent a letter to Secretary Acosta, condemning this decision to hide the truth about just how much could be stolen from American workers and demanding answers. Americans are working harder and longer than ever before, but with less and less to show for it. I support legislation that would phase out the tipped minimum wage entirely. People like Cristal work hard to support their families and they shouldn’t be forced to work for less, simply because they earn tips. But in the meantime, we cannot allow the tips they do earn to be stolen, and we cannot allow this regulation to make it even harder for Ohioans to earn a living, no matter how hard they work. 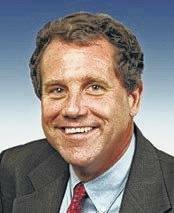 Reach Senator Sherrod Brown via his Cincinnati office, 425 Walnut St., Suite 2310, Cincinnati, OH 45202. Phone (513) 684-1021, Toll Free 1-888-896-6446.